Super Bowl LI was an American football game played at NRG Stadium in Houston, Texas, on February 5, 2017, to determine the champion of the National Football League (NFL) for the 2016 season. The American Football Conference (AFC) champion New England Patriots, after trailing by as many as 25 points (28–3) during the third quarter, defeated the National Football Conference (NFC) champion Atlanta Falcons, 34–28 in overtime. The Patriots' 25-point comeback is the largest comeback in Super Bowl history, and Super Bowl LI was the first to be decided in overtime. U.S. viewership: 111.3 million est. avg. The Patriots' victory was their fifth, and moved them into a three-way tie with the Dallas Cowboys and the San Francisco 49ers for second place on the all-time Super Bowl wins list, trailing only the Pittsburgh Steelers who have six victories. New England, after finishing the regular season with a league-best 14–2 record, advanced to their record-setting ninth Super Bowl appearance, their second in three years, and their seventh under the leadership of head coach Bill Belichick and quarterback Tom Brady. The Falcons entered the game after completing an 11–5 regular season record, and were trying to win their first Super Bowl title, having lost their only previous appearance in Super Bowl XXXIII. After a scoreless first quarter, Atlanta scored 21 points before New England made a field goal with two seconds left in the second quarter, to make it a 21–3 halftime lead. The Falcons then increased their lead to 28–3 midway through the third quarter, with quarterback Matt Ryan completing his second touchdown pass. The Patriots then scored 25 unanswered points to tie the game, 28–28, with 57 seconds left in regulation. New England won the overtime coin toss, received the kickoff and drove 75 yards to win with a 2-yard touchdown run by running back James White. When the game ended, more than 30 team and individual Super Bowl records had been either broken or matched. White's 14 receptions and his 20 points scored (off of 3 touchdowns and a two-point conversion) were among these broken records. New England Patriots quarterback Tom Brady, who also broke single-game Super Bowl records with 43 completed passes, 62 pass attempts, and 466 passing yards, was named Super Bowl MVP for a record fourth time. Fox's broadcast of the game averaged around 111.3 million viewers, slightly down from the 111.9 million viewers of the previous year's Super Bowl, while the total number of viewers for all or part of the game hit a record number of 172 million. Average TV viewership for the halftime show, headlined by Lady Gaga, was higher at 117.5 million. On the following day a number of media outlets immediately hailed the game as the greatest Super Bowl of all time. The NFL selected the sites for Super Bowl 50 and Super Bowl LI at the owners' spring meetings in Boston on May 21, 2013. On October 16, 2012, the NFL announced that Reliant Stadium in Houston, which was renamed NRG Stadium in 2014, was a finalist to host Super Bowl LI. Houston then competed against the runner-up for the site of Super Bowl 50: Hard Rock Stadium in Miami Gardens, Florida. The South Florida bid for either Super Bowl partially depended on whether the stadium underwent renovations. However, on May 3, the Florida Legislature refused to approve the funding plan to pay for the renovations, dealing a blow to South Florida's chances. The NFL ultimately selected Houston as the host city of Super Bowl LI. This was the second Super Bowl to be held at NRG Stadium, the other being Super Bowl XXXVIII in 2004, which also featured the New England Patriots against that season's NFC South champion Carolina Panthers. It was also the third time the Super Bowl has been played in Houston, with Super Bowl VIII in 1974 having been held at Rice Stadium. With the Astros baseball team reaching the World Series eight months later, Houston would become just the fourth city to host both the Super Bowl and Fall Classic in the same calendar year, following San Diego (1998), Detroit (2006) and Arlington, Texas (2011), and the first among the four to win the Major League Baseball championship. Proposition 1, an ordinance which would have prohibited discrimination on the basis of sexual orientation or gender identity in Houston's housing, employment, public accommodations, and city contracting, was rejected by voters (60.97% opposing) during the November 3, 2015 elections. Subsequently, the NFL announced it would not alter plans to have the city host Super Bowl LI. Houston Texans owner Bob McNair donated $10,000 to Campaign for Houston, an organization that opposes the ordinance, which he later rescinded. In 2016, New England tied an NFL record, earning 12+ wins for the seventh consecutive season. Even though starting quarterback Tom Brady was suspended for the first four games, and All-Pro tight end Rob Gronkowski was lost to injury in midseason, the Patriots still recorded an NFL-best 14–2 record; their only losses were a shutout loss to the Buffalo Bills in Week 4 and a loss to the Seattle Seahawks in Week 10. They scored 441 points (third in the NFL) while allowing the fewest in the league (250). Brady missed the first four games of the year on suspension due to a 2014 postseason incident known as Deflategate. Jimmy Garoppolo and Jacoby Brissett each started two games in Brady's place. After his suspension ended, Brady took back command of the offense and went on to earn his 12th Pro Bowl selection, passing for 3,554 yards and 28 touchdowns, with only two interceptions, while his 112.2 passer rating ranked second in the NFL. The team's leading receiver was Julian Edelman, who caught 98 passes for 1,106 yards and added 135 more returning punts. Wide receivers Chris Hogan (38 receptions for 680 yards) and Malcolm Mitchell (32 receptions for 401 yards) were also significant receiving threats. Gronkowski caught 25 passes for 540 yards before suffering a season-ending back injury in week 13. Tight end Martellus Bennett stepped up in his absence, hauling in 55 receptions for 701 yards and a team-leading seven touchdown catches. Running back LeGarrette Blount was the team's top rusher with 1,168 yards and a league-leading 18 touchdowns. In passing situations, the team relied heavily on running back James White, who caught 60 passes for 551 yards and added another 166 on the ground. Running back Dion Lewis was also a valuable asset to the offense, rushing for 283 yards on offense and catching 17 passes for 94 yards. Despite trading All-Pro outside linebacker Jamie Collins to the Cleveland Browns in the middle of the season, the Patriots defensive line was led by tackle Trey Flowers, who ranked first on the team with seven quarterback sacks, and Jabaal Sheard, who recorded five sacks of his own. Linebacker Dont'a Hightower earned his first Pro Bowl selection and made the second All-Pro team, compiling 65 tackles and 2½ sacks. Linebacker Rob Ninkovich also made a big impact, recording 34 tackles, two forced fumbles, and four sacks. In the secondary, cornerback Malcolm Butler led the team with four interceptions, while Logan Ryan led the team in tackles and intercepted two passes. Safety Devin McCourty ranked second on the team with 83 tackles and notched one interception while earning his third career Pro Bowl selection. The team also had a defensive expert on special teams, Matthew Slater, who made the Pro Bowl for the sixth consecutive year. By advancing to play in Super Bowl LI, the Patriots earned their NFL-record ninth Super Bowl appearance, as well as their seventh in the past 16 years under Brady and head coach Bill Belichick. The Patriots have also participated in the only other Super Bowl to be held at NRG Stadium; they won Super Bowl XXXVIII over the Carolina Panthers by a 32–29 score 13 years earlier. The Patriots entered Super Bowl LI with an overall record of 4–4 in their previous eight Super Bowl appearances, with all four of their wins and two of their four losses coming under the leadership of Belichick and Brady. With his appearance in Super Bowl LI, Belichick broke the tie of six Super Bowls as a head coach that he had shared with Don Shula. It was also his record tenth participation in a Super Bowl in any capacity, which overtook the mark of nine that he had shared with Dan Reeves. This was also Brady's seventh Super Bowl appearance, the most appearances by a player in Super Bowl history. The Atlanta Falcons, under second-year head coach Dan Quinn, finished the 2016 season with an 11–5 record, earning them the No. 2 seed in the NFC playoffs. It was a big reversal of declining fortunes for the team, who had failed to qualify to play in the playoffs in each of the last three seasons. The Falcons were loaded with offensive firepower, leading all NFL teams in scoring with 540 points. Nine-year veteran quarterback Matt Ryan earned the NFL MVP and the AP NFL Offensive Player of the Year Award, as well as his fourth career Pro Bowl selection, leading the league in passer rating (117.1). While he ranked only ninth in completions (373), his passing yards (4,944) and touchdowns (38) both ranked second in the NFL. His favorite target was receiver Julio Jones, who caught 83 passes for 1,409 yards (second in the NFL) and six touchdowns. But Ryan had plenty of other options, such as newly acquired wide receivers Mohamed Sanu (59 receptions for 653 yards) and Taylor Gabriel (35 receptions for 579 yards and six touchdowns). Pro Bowl running back Devonta Freeman was the team's leading rusher, with 1,078 yards, 11 touchdowns, and 4.8 yards per rush. He was also a superb receiver out of the backfield, catching 54 passes for 462 yards and two more scores. Running back Tevin Coleman was also a major asset on the ground and through the air, with 520 rushing yards, 31 receptions for 421 yards, and 11 total touchdowns. The Falcons also had an excellent special teams unit led by veteran kick returner Eric Weems. His 24 punt returns for 273 yards gave him the sixth highest return average in the NFL (11.4), and he added another 391 yards returning kickoffs. Pro Bowl kicker Matt Bryant led the league in scoring with 158 points, while also ranking third in field goal percentage (91.8%). Atlanta's offensive line featured center Alex Mack, who earned his fourth Pro Bowl selection. The Falcons defensive line was led by defensive ends Adrian Clayborn, who recorded five sacks and a fumble recovery, and long-time veteran Dwight Freeney, who ranks as the NFL's 18th all-time leader in sacks (122½). Behind them, linebacker Vic Beasley was the team's only Pro Bowl selection on defense, leading the NFL in sacks with 15½; he also forced six fumbles. Rookie linebacker Deion Jones was also an impact player, leading the team in combined tackles (108) and interceptions (three). The Falcons secondary featured hard-hitting safety Keanu Neal, who had 106 tackles and forced five fumbles. Safety Ricardo Allen added 90 tackles and two interceptions. But overall, the defense ranked just 27th in the league in points allowed (406). This game marked the Falcons' second Super Bowl appearance in franchise history, after having lost Super Bowl XXXIII in January 1999 to the Denver Broncos. The Patriots, with the AFC's #1 seed, began their postseason run by defeating the fourth-seeded Houston Texans in the Divisional Round, 34–16. The next week, in the AFC Championship Game, the Patriots defeated the third-seeded Pittsburgh Steelers 36-17. The Falcons, with the NFC's #2 seed, began their postseason run by defeating the third-seeded Seattle Seahawks in the Divisional Round, 36–20, racking up 422 yards. The next week, in the last NFL game ever played at the Georgia Dome, the Falcons racked up 493 total yards as they defeated the fourth-seeded Green Bay Packers 44–21 to win the NFC Championship. 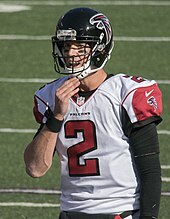 As the designated home team in the annual rotation between AFC and NFC teams, the Falcons elected to wear their red home jerseys with white pants, which meant that the Patriots wore their white road jerseys. The game featured Atlanta's #1 scoring offense versus New England's #1 scoring defense. This was the sixth Super Bowl since the AFL–NFL merger in 1970 to feature a #1 scoring offense against a #1 scoring defense, with the team with the #1 scoring defense winning four of the previous five matchups. Fan-oriented activities during the lead-up to Super Bowl LI were centered around the George R. Brown Convention Center and Discovery Green park. Discovery Green hosted Super Bowl Live, a 10-day festival which featured live concerts and other attractions, including projection shows, fireworks shows, and a virtual reality attraction, Future Flight, in conjunction with NASA. The neighboring George R. Brown Convention Center hosted the annual NFL Experience event, which featured interactive activities and appearances by players. Super Bowl Opening Night, the second edition of the game's revamped media day, was held on January 30, 2017 at nearby Minute Maid Park. Super Bowl Live was organized by the Houston Super Bowl Host Committee, which was led by Honorary Chairman James A. Baker, III, Chairman Ric Campo, and President and CEO Sallie Sargent. According to Bloomberg story two most anticipated pre-Super Bowl parties were invite-only 13th annual ESPN party and the Rolling Stone party. ESPN party was hosted by Fergie and DJ Khaled and took place in a 65,000-square-foot warehouse in the Houston Arts District. The Rolling Stone party celebrated the magazine 50th anniversary. It took place at the Museum of Fine Arts, Houston and featured the performance of Big Sean, DJ Cassidy, Nas, Diplo and Busta Rhymes. The Patriots stayed at the JW Marriott Houston and practiced at the University of Houston. The Falcons stayed at the Westin Houston Memorial City and practiced at Rice University. In the beginning of February 2017 the NFL and law enforcement announced that tickets to Super Bowl LI would feature heat-sensitive logos to deter counterfeit tickets. On the front of each ticket was a full polymer graphic that was raised and the back featured a true color security label with Houston's skyline and the Super Bowl logo. The final security feature was a graphic on the lower portion of the back of each ticket printed with thermochromic ink. The HTX logo and the NRG Stadium image faded when heat was applied and returned when the heat source was removed. The estimated average price for a ticket was $4,744. In late 2016, Uber had threatened to leave Houston ahead of the Super Bowl LI festivities, insisting various city regulations, including fingerprint background checks of drivers, were too burdensome and prevented drivers from working. Houston officials and Uber reached a compromise in December, which determined that Houston would continue to require a fingerprint check for drivers but eliminate requirements for driver drug testing and physicals through at least February 5. In the United States, Super Bowl LI was televised by Fox, as part of a cycle between the three main broadcast television partners of the NFL. The game was carried in Spanish by sister cable network Fox Deportes. Online streams of the game were provided via Fox Sports Go; although normally requiring a television subscription to use, Fox made the service available as a free preview for the Super Bowl. Due to Verizon Communications exclusivity, streaming on smartphones was exclusive to Verizon Wireless subscribers via the NFL Mobile app. As with Super Bowl 50, the stadium was equipped for Intel freeD instant replay technology, using an array of 36 5K resolution cameras positioned around the stadium to enable 360-degree views of plays. Fox introduced a new feature utilizing the system known as Be the Player, which composited the various camera angles into a single view of a play from the point-of-view of a player on the field. Fox constructed a temporary, two-floor studio in Discovery Green, which originated pre-game coverage, and broadcasts of Fox Sports 1 studio programs during the week leading up to the game, such as Fox Sports Live with Jay and Dan, The Herd with Colin Cowherd, Skip and Shannon: Undisputed, NASCAR Race Hub, and UFC Tonight. An average of 111.3 million viewers watched Super Bowl LI, down from 2016. Fox stated that 1.72 million viewers utilized its online streams. Fox set the base rate for a 30-second commercial at $5 million, the same rate CBS charged for Super Bowl 50, leading to advertising revenue of $534 million for the single day event. Snickers announced that it would present a live commercial during the game. Nintendo broadcast an ad showcasing its upcoming Nintendo Switch video game console. Fiat Chrysler Automobiles broadcast three spots for Alfa Romeo, as part of an effort to re-launch the Italian brand in the U.S.
A spot from longtime advertiser Budweiser garnered controversy before the game for depicting Anheuser-Busch co-founder Adolphus Busch's emigration to the United States from Germany, its broadcast coming on the heels of U.S. President Donald Trump signing an executive order that bans travelers from several Muslim nations. Meanwhile, 84 Lumber aired a commercial depicting a mother and daughter journeying from Mexico to the United States, which had been edited following Fox's objection to its depiction of a border wall for sensitivity reasons. Many films were advertised with Guardians of the Galaxy Vol. 2, Logan, Transformers: The Last Knight, Pirates of the Caribbean: Dead Men Tell No Tales and The Fate of the Furious. AMC and Netflix advertised their shows, The Walking Dead and Stranger Things, respectively, while Fox-owned National Geographic Channel teased its new historical anthology drama series Genius with an ad featuring Albert Einstein and a nod to Lady Gaga's halftime performance. Fox was able to earn an estimated $20 million by airing four extra commercials due to the additional overtime period. Even without historical precedent, Fox negotiated deals with a handful of advertisers in case overtime were to occur. Canadian broadcast rights to Super Bowl LI were subject to a still-ongoing legal dispute; although U.S. network affiliates are carried by pay TV providers in the country, Canadian law grants domestic broadcast stations the right to require that these signals be substituted with their own if they are carrying the same program in simulcast with a U.S. station ("simsub"). This policy is intended to help protect Canadian advertising revenue from being lost to viewers watching via U.S. feeds of a program. In 2016, as part of a larger series of regulatory reforms, the Canadian Radio-television and Telecommunications Commission (CRTC) banned the Super Bowl from being substituted under these circumstances, meaning that the telecast on CTV—a simulcast of the U.S. telecast with Canadian advertising inserted, would co-exist with feeds of the game from U.S. network affiliates. The CRTC cited dissatisfaction surrounding the practice from Canadian viewers—particularly the unavailability of the U.S. commercials, which the CRTC cited as being an "integral part" of the game based on this reception, but also other technical problems caused by poorly implemented simsubs (such as reduced quality and missing content due to mistimed transitions back into the U.S. program feed). The NFL's Canadian rights holder Bell Media, as well as the league itself, have displayed objections to the policy; Bell felt that the decision devalued its exclusive Canadian rights to the game, and violated Canada's Broadcasting Act, which forbids the "making of regulations singling out a particular program or licensee." On November 2, 2016, Bell was granted the right to challenge the ruling in the Federal Court of Appeal. Bell, the NFL, and government representatives from both Canada and the U.S., have lobbied the CRTC for the rule to be retracted. However, court action on the ruling was not taken in time for the game, meaning that it was in effect for the first time during Super Bowl LI. Bell Media cited the decision, among other factors, as justification for a planned series of layoffs it announced on January 31, 2017. The simsub prohibition only applied to the game itself, and not pre-game or post-game programming (which was simulcast with Fox and subject to simsub). In an attempt to mitigate the loss of de facto exclusivity to the clean U.S. feeds, Bell simulcast the game across CTV Two and TSN in addition to CTV, and organized a sponsored sweepstakes in which viewers could earn entries to win cash and automobile prizes by texting keywords displayed during the Canadian telecast. Montreal Gazette media analyst Steve Faguy felt that these promotions were an attempt to offset the loss of viewership by carrying the game across as many of its channels as possible, and providing incentives for viewers to watch the game on CTV instead of Fox. He further noted that Bell still had exclusive rights to stream the game in Canada via CTV's TV Everywhere services, as the CRTC does not regulate web content, and Fox's online stream is only available to U.S. users. Consequently, some Canadian companies (such as Leon's and Pizza Pizza) took advantage of the CRTC decision by buying local advertising time during the game from Fox affiliates distributed in Canada in order to target these viewers, such as KAYU-TV in Spokane (which is widely carried by television providers in the significantly larger markets of Calgary and Edmonton, Alberta). Viewership of Super Bowl LI across the three English-language Bell Media properties broadcasting it was down by 39% in comparison to Super Bowl 50, with only 4.47 million viewers. Viewership on the French-language telecast presented by TSN's sister network RDS was in line with that of Super Bowl 50. It is not known how many Canadian viewers watched the game via Fox, as neither Nielsen or Canadian ratings provider Numeris calculate Canadian viewership of American broadcasters. In the United States, Westwood One carried the broadcast nationwide, with Kevin Harlan on play-by-play, Boomer Esiason and Mike Holmgren on color commentary, and sideline reports from Tony Boselli and James Lofton. The Westwood One broadcast was simulcast in Canada on TSN Radio. Each team's network flagship station carried the local feed: WBZ-FM for the Patriots (with Bob Socci and Scott Zolak announcing), and WZGC for the Falcons (with Wes Durham and Dave Archer announcing); under the league's contract with Westwood One, no other stations in the teams' usual radio networks were allowed to carry the local broadcast, and unlike in recent years when at least one of the two flagships was a clear-channel station, both the Patriots and Falcons use FM radio stations as their local flagships, limiting listenership to those within the local metropolitan areas or with access to those feeds via Sirius XM satellite radio or TuneIn Premium. Spanish-language radio rights are held by Entravision as part of a three-year agreement signed in 2015. Erwin Higueros served as the play-by-play announcer. The United Kingdom's BBC Radio 5 Live produced a commercial-free broadcast, with Darren Fletcher and Rocky Boiman returning. "May this year’s Super Bowl be a sign of peace, friendship, and solidarity to the world." –Pope Francis indicated that by participating in sports events, people show an ability to go beyond self-interests and build friendship and solidarity with one another. During pre-game festivities, the NFL honored members of the Pro Football Hall of Fame that had played college football at historically black colleges and universities. Of the 303 members of the Hall of Fame, 29 were from HBCUs. The Patriots took the field first as the designated away team to Ozzy Osbourne's "Crazy Train". The Falcons took the field second as the designated home team to Trick Daddy's "Let's Go". Both teams' season recaps were presented by Ving Rhames. Before the game, American country music singer and songwriter Luke Bryan sang the US national anthem. Bryan was the first male performer to sing the national anthem at a Super Bowl since Billy Joel at Super Bowl XLI. Immediately before Bryan sang the national anthem, Phillipa Soo, Renée Elise Goldsberry and Jasmine Cephas Jones, who originated the roles of the Schuyler sisters in the Broadway musical Hamilton, performed "America the Beautiful". After the national anthem, former President George H. W. Bush performed the coin toss alongside his wife, Barbara. The Patriots called heads, but the Falcons won the coin toss with tails. The Falcons chose to defer to the second half. On September 29, 2016, Lady Gaga, who had performed the national anthem the previous year at Super Bowl 50, confirmed that she would be performing at the Super Bowl LI halftime show on her Instagram account with the message: "It's not an illusion. The rumors are true. This year the SUPER BOWL goes GAGA!" Fox Sports president and executive producer of the show, John Entz, confirmed Gaga's involvement adding "[She] is one of the most electric performers of our generation, and we couldn't be happier with the choice to have her headline the Super Bowl LI Halftime Show... It is going to be an incredible night." Lady Gaga opened the halftime show with a combination of "God Bless America" and "This Land Is Your Land". Her performance also included some of her biggest hit songs, such as "Poker Face", "Born This Way", "Million Reasons", and "Bad Romance" and was accompanied by a swarm of 300 LED-equipped Intel drones forming an American flag in the sky in a pre-recorded segment. Mohamed Sanu stated the long length of the halftime show played a part in Atlanta ultimately losing the game. Teams on average are off the field for fifteen minutes during halftime, but Super Bowl halftimes are considerably longer. Unlike the Falcons it appears Bill Belichick actually incorporated the length of the show into the team's practices. Sanu's argument was discounted by the fact that Atlanta marched the ball downfield and scored a touchdown right out of halftime. The first quarter of Super Bowl LI was a scoreless defensive match with each team punting twice. The longest play from scrimmage was a 37-yard carry by Falcons running back Devonta Freeman, which did not lead to any points, though it would be the longest run of the game for either team. On the first play of the second quarter, New England's quarterback Tom Brady completed a 27-yard pass to wide receiver Julian Edelman on the Falcons 33-yard line. But on the next play, linebacker Deion Jones stripped the ball from running back LeGarrette Blount; the fumble was recovered by defensive back Robert Alford on the 29-yard line. On the next two plays, Matt Ryan completed passes to Julio Jones for gains of 19 and 23 yards. Freeman ran the ball on the next three plays, covering the final 29 yards to the end zone, the last carry a 5-yard touchdown run that put Atlanta up 7–0. New England failed to get a first down on the series following the Freeman score, and the Falcons moved the ball 62 yards in five plays. Ryan started the drive with a 24-yard completion to Taylor Gabriel, then completed a pass to Jones for an 18-yard gain. On 3rd-and-9, he threw a 19-yard touchdown pass to tight end Austin Hooper, giving the Falcons a 14–0 lead. It was the largest deficit Brady had ever faced in his seven Super Bowl appearances, and it would soon get larger. New England responded with a drive to the Falcons 23, aided by three defensive holding penalties against the Atlanta defense, each one giving them a first down on a third down play. However, on 3rd-and-6, Brady threw a pass that was intercepted by Alford and returned 82 yards for a touchdown, increasing Atlanta's lead to 21–0. It was the first time in his career that Brady had thrown a pick-six (interception returned for a touchdown) in his 33 postseason games, and Alford's 82 yard return was the second longest interception return in Super Bowl history. Brady ultimately became the first quarterback to win a Super Bowl in which he threw a pick-six. Getting the ball back with 2:20 left in the second quarter, Brady completed a 15-yard pass to Martellus Bennett, and then a short pass to running back James White, who took off for a 28-yard gain. The drive stalled at the Falcons 20-yard line, but Stephen Gostkowski kicked a field goal with two seconds left on the clock to send the teams into their locker rooms with the score 21–3. New England had an early third quarter scoring opportunity when Edelman returned a punt 26 yards to the Patriots' 47-yard line, but they could not gain a first down on the drive. Following the Patriots' punt, the Falcons started their drive on their own 15-yard line, Ryan completed two long passes to wide receiver Taylor Gabriel for gains of 17 and 35 yards to bring the ball to the New England 28-yard line. Four plays later, Ryan finished the 85-yard drive with a 6-yard touchdown pass to running back Tevin Coleman, giving the Falcons a 28–3 lead with 8:31 left in the quarter. On the next series, Brady led the Patriots 75 yards in 13 plays for a responding touchdown, completing five of seven passes for 43 yards, the biggest a 17-yard completion to Danny Amendola on 4th-and-3 from the New England 46-yard line. Brady also made a big play with his legs, rushing for a 15-yard gain (which would be the longest rushing play by the Patriots on the day) on 3rd-and-8 from the Atlanta 35-yard line. Three subsequent carries by Blount moved the ball 15 yards to the 5-yard line, and then Brady threw the ball to White for a touchdown, making the score 28–9 after Gostkowski's extra point attempt hit the right goalpost. New England then attempted an onside kick, but the ball was recovered by Falcons linebacker LaRoy Reynolds, and a penalty against Gostkowski for touching the ball before it went ten yards gave Atlanta even better field position. Ryan completed a 9-yard pass to Hooper to the Patriots 32-yard-line, but on the next play, a holding penalty on Atlanta offensive lineman Jake Matthews pushed the team back ten yards. Then after an incompletion, Trey Flowers and Kyle Van Noy shared a sack on Ryan that forced the Falcons to punt on the first play of the fourth quarter. Matt Bosher's 42-yard punt pinned the Patriots back on their own 13-yard line. Brady led the next drive down the field, completing three passes to wide receiver Malcolm Mitchell for 40 yards and one to Bennett for 25 to bring the ball to the Falcons 7-yard line. However, Brady was sacked twice by defensive tackle Grady Jarrett over the next three plays, and the Patriots ended up having to settle for Gostkowski's 33-yard field goal that cut their deficit to two scores, 28–12, with less than 10 minutes left in the game. Atlanta had burned two of their three time outs on defense and equipment malfunction. On the third play of Atlanta's ensuing drive, Freeman missed his blocking assignment on a New England blitz that allowed linebacker Dont'a Hightower to sack Ryan as he was winding up for a pass, resulting in a fumble that was recovered by defensive tackle Alan Branch on the Falcons 25-yard line. It was Ryan's first turnover in two months. New England soon cashed in their scoring opportunity, with Brady throwing a 6-yard touchdown pass to Amendola. Then White took a direct snap in for a two-point conversion to make the score 28–20 in favor of Atlanta with 5:56 left on the clock. The Patriots had run the same play for a two-point conversion with Kevin Faulk in their Super Bowl XXXVIII victory. On the first play of Atlanta's next possession, Freeman caught a short pass from Ryan and ran it for a 39-yard gain, the longest play of the game for either team. Then on 2nd-and-9 from the Patriots 49-yard line, Ryan threw a deep pass to Jones, who made an acrobatic catch at the right sideline for a 27-yard gain, giving the Falcons a first down on the Patriots 22-yard line with 4:40 left on the clock and a chance for a late-game two-score lead that would have clinched the game. On the next play, Freeman ran for a 1-yard loss on a tackle by Devin McCourty. Atlanta tried to pass the ball on second down, but Flowers sacked Ryan for a 12-yard loss on the Patriots 35-yard line. Ryan then completed a 9-yard pass to Mohamed Sanu on 3rd-and 23, but this was negated by a holding penalty on Matthews. Now out of field goal range and faced with 3rd-and-33 from the New England 45-yard line, Ryan threw an incomplete pass, and the team was left with no choice but to punt the ball to New England. Bosher's 36-yard kick gave the Patriots the ball on their own 9-yard line with 3:30 left on the clock and two of their timeouts left. After two incompletions, Brady picked up a first down with a 16-yard pass to Chris Hogan. After an 11-yard pass to Mitchell, Brady threw a pass that was nearly intercepted by Alford. Instead, he batted the ball in the air, and it fell into the arms of Edelman, who made a diving catch as it bounced off the shoe of another Falcon's player and just barely managed to get his hands under the ball before it hit the ground, picking up 23 yards. Atlanta challenged the catch, but the referees confirmed the call on the field and Atlanta lost their final time out. Brady's next pass to Amendola gained 20 yards to the Falcons 21-yard line as the clock ran down below the two-minute warning. Two more passes to White gained 20 yards and gave New England a first down at the 1-yard line. With 58 seconds left, White scored on a 1-yard touchdown run, and Brady completed a 2-point conversion pass to Amendola, tying the score at 28. Atlanta started their drive deep in their own end with just under a minute and zero time outs. The Falcons failed to get in range to score a possible game-winning field goal and punted, with the Patriots fair catching the ball at their own 35-yard line. The Patriots considered, but ultimately declined, ending regulation on what would have been the first fair catch kick ever attempted in a Super Bowl. Instead, New England attempted a fake quarterback kneel running play for Dion Lewis, who gained several yards but failed to score, ending the fourth quarter and forcing the game into overtime, the first time this had happened in the Super Bowl era, and the first in the NFL title game since the 1958 meeting between the Baltimore Colts and the New York Giants. The Patriots won the coin toss to start overtime, and elected to receive the ball. Starting at their 25-yard line after a touchback, Brady completed passes to White, Amendola, and Hogan for gains of 6, 14, and 18 yards, respectively. Then after White was dropped for a 3-yard loss, Brady completed a 15-yard pass to Edelman to the Falcons 25-yard line. White then took a lateral throw from Brady to the 15-yard line. Brady's pass to Bennett in the end zone fell incomplete, but Falcons linebacker De'Vondre Campbell was called for pass interference, giving the Patriots first-and-goal from the Falcons' 2-yard line. On first down, Brady threw another incomplete pass to Bennett that was deflected by Vic Beasley. On second down, White took a pitch and ran the ball right. He was hit by Falcons defenders at the 1-yard line, but managed to stretch forward and get the ball across the goal line before his knee hit the ground, scoring a touchdown to give the Patriots the 34–28 victory. It marked the first time in NFL postseason history that a team leading by 17 points or more at the start of the fourth quarter went on to lose the game. Previously, dating back to 1940, teams leading by 17 or more points after three quarters in playoff games were 133–0 in such situations. Super Bowl LI had more than 30 records either broken, set, or tied by the time it was done. Brady completed 43 of 62 passes for 466 yards and two touchdowns, with one interception, while also rushing for 15 yards. His completions, attempts, and passing yards were all single-game Super Bowl records. He also set the career Super Bowl records for games played (7), completions (207), attempts (309), yards (2,071), and touchdown passes (15). James White caught a Super Bowl record 14 passes for 110 yards, rushed for 29 yards, and tied a Super Bowl record with three touchdowns. He also set the record for most points scored with 20. After the game, Brady said he felt White deserved the MVP award more than he did. Brady planned to give White the vehicle that has traditionally been awarded to Super Bowl MVPs (he'd given the truck he received after Super Bowl XLIX to Malcolm Butler) but found out after the game that there was no vehicle to give to White because the sponsor had decided to end its practice of donating one. Edelman caught five passes for 87 yards and returned three punts for 39 yards. Amendola recorded eight receptions for 78 yards and one touchdown. Flowers recorded six tackles and 2.5 sacks. For Atlanta, Ryan completed 17 of 23 passes for 284 yards and two touchdowns. Freeman was the top rusher of the game with 11 carries for 75 yards and a touchdown, while also catching two passes for 46 yards. Jones was Atlanta's leading receiver with four receptions for 87 yards. Robert Alford had 11 tackles (9 solo), an interception returned for a touchdown, and a fumble recovery. Grady Jarrett had five tackles and tied a Super Bowl record with three sacks. Atlanta became the first team in Super Bowl history to return an interception for a touchdown and lose the game. Prior to Super Bowl LI, teams returning an interception for a touchdown in the Super Bowl had been a perfect 12–0. New England had two turnovers for the game, while Atlanta only turned the ball over once. This made New England the fifth team to win a Super Bowl despite losing the turnover battle, joining the Baltimore Colts in Super Bowl V, the Pittsburgh Steelers in Super Bowls XIV and XL, and the Patriots in Super Bowl XLIX. The game set the record for the largest deficit overcome to win the Super Bowl (the previous record was ten points, set by the Washington Redskins in Super Bowl XXII and matched by the New Orleans Saints in Super Bowl XLIV and by the Patriots in Super Bowl XLIX); it is the third-largest comeback win in NFL playoff history, behind The Comeback (32-point deficit; Buffalo Bills trailed 35–3 and won 41–38) and the wild card game between the Indianapolis Colts and the Kansas City Chiefs during the 2013–14 NFL playoffs (28-point deficit; Colts trailed 38–10 and won, 45–44). In addition to being the largest Super Bowl comeback, the game set the record for the largest fourth-quarter comeback in NFL playoff history, as no team had previously won a playoff game after trailing by 17 or more points entering the final quarter; the Patriots were trailing by 19 points at the start of the fourth quarter by a score of 28–9. The Patriots won their fifth franchise championship, all under the leadership of starting quarterback Tom Brady, the most by a single quarterback. Brady won his fourth Super Bowl MVP, the most such awards by a single player in history. This game represented the largest comeback in the history of the New England Patriots' regular season or post-season games, and Tom Brady's NFL career. Late in the third quarter, the Falcons' chances of winning were estimated at 99.8%. Super Bowl LI had eight officials. The numbers in parentheses below indicate their uniform numbers. ^ Williams, Cody (January 22, 2017). "Super Bowl 51: Patriots Open As Favorites Over Falcons". Fox Sports. Retrieved January 23, 2017. ^ a b Austro, Ben (January 18, 2017). "Carl Cheffers is confirmed as referee for Super Bowl LI". FootballZebras.com. Retrieved January 18, 2017. ^ "Super Bowl LI Game Summary" (PDF). National Football League. February 5, 2017. Retrieved February 6, 2017. ^ "Luke Bryan to sing the National Anthem at Super Bowl LI on Fox". National Football League. Retrieved February 3, 2017. ^ Chasmar, Jessica. "George H.W. Bush to flip coin at Super Bowl LI". The Washington Times. Retrieved February 3, 2017. ^ "Ratings: Super Bowl LI Posts Huge Numbers, Just Shy of Record (Updated)". Yahoo!. February 6, 2017. Retrieved February 7, 2017. ^ "Houston Super Bowl Host Committee announces date of Super Bowl LI". KTRK-TV. Houston: American Broadcasting Companies, Inc. May 21, 2015. Retrieved May 21, 2015. ^ Clayton, John (February 5, 2017). "Ranking all 51 Super Bowls". Houston: ESPN. Retrieved February 6, 2017. ^ "Super Bowl LI Box Score". The Football Database. Patrick Gilligan. February 5, 2017. Retrieved February 7, 2017. ^ Wesseling, Chris (February 5, 2017). "Patriots erase deficit, defeat Falcons in Super Bowl LI". National Football League. Retrieved July 22, 2017. ^ "Falcons-Patriots first teams to play in SB overtime". National Football League. February 5, 2017. Retrieved February 6, 2017. ^ Boren, Cindy (February 5, 2017). "What happens in overtime in the Super Bowl?". The Washington Post. Retrieved February 6, 2017. ^ a b c Bergman, Jeremy (February 6, 2017). "At least 30 records set or tied in Super Bowl LI". National Football League. Retrieved February 7, 2017. ^ "Dozens of records were set or tied in Super Bowl LI. The list …". The Denver Post. Digital First Media. Retrieved February 20, 2017. ^ "Super Bowl LI Audience Hits a Record 172 Million Viewers". ComingSoon.net. February 6, 2017. Retrieved September 15, 2018. ^ a b "Super Bowl's TV ratings slip for the second straight year". Los Angeles Times. Retrieved February 7, 2017. ^ Melas, Chloe. "Lady Gaga brings message of inclusion to Super Bowl halftime -- oh, and drones". CNN. Retrieved February 6, 2017. ^ Schwindt, Oriana (February 6, 2017). "Super Bowl LI Pulls in 111.3 Million Viewers on Fox, Shy of 2015 Ratings Record". Variety. Retrieved February 6, 2017. ^ Carpenter, Les (February 6, 2017). "Simply, the best Super Bowl ever". The Guardian. Retrieved December 6, 2017. ^ Steele, David (February 6, 2017). "Seeing is believing: Patriots' comeback made for best Super Bowl ever". Sporting News. Retrieved December 6, 2017. ^ Gagnon, Brad (February 6, 2017). "Super Bowl LI Was the Best Ever". Bleacher Report. Retrieved December 6, 2017. ^ a b "NFL plans "spectacular" Super Bowl L". Pro Football Talk. NBC Sports. Retrieved October 9, 2012. ^ a b McClain, John (October 16, 2012). "Houston a finalist to host Super Bowl LI in 2017". San Antonio Express-News. Houston. Retrieved October 22, 2012. ^ "Fla. Legislature refuses to aid Fins". ESPN. Associated Press. May 3, 2013. Retrieved May 3, 2013. ^ "Cumulative Report, Harris County, Texas, General and Special Elections" (PDF). HARRISVotes.com. November 3, 2015. 9. ^ Robinson, Charles (November 7, 2015). "NFL won't alter Houston Super Bowl plans after city's repeal of non-discrimination law". Houston: Yahoo! Sports. Retrieved November 7, 2015. ^ Gryboski, Michael (October 18, 2015). "Former Astros Star Speaks Out Against Houston's Transgender Bathroom Ordinance". Christian Post. Retrieved February 11, 2016. ^ Gibbs, Lindsay (October 16, 2015). "Texans Owner Donates $10,000 To Fight LGBT Protections In Houston". ThinkProgress.org. Retrieved December 28, 2015. ^ "Boston/New England Patriots Team Encyclopedia - Pro-Football-Reference.com". ^ a b "2016 New England Patriots Statistics & Players - Pro-Football-Reference.com". ^ "Four Patriots Selected to NFL Pro Bowl Squad". New England Patriots. December 20, 2016. ^ "Bill Belichick Record, Statistics, and Category Ranks - Pro-Football-Reference.com". ^ "Which NFL quarterback has been to the most Super Bowls?". Sports Illustrated. January 6, 2017. ^ "LOOK: Tom Brady has played in more Super Bowls than the entire Falcons roster". CBS Sports. January 25, 2017. ^ "Atlanta Falcons Team Encyclopedia - Pro-Football-Reference.com". ^ "2016 NFL Scoring Summary". Pro-Football-Reference.com. Retrieved December 28, 2017. ^ "2016 NFL Kicking & Punting". Pro-Football-Reference.com. Retrieved December 28, 2017. ^ a b "2016 Atlanta Falcons Statistics & Players - Pro-Football-Reference.com". ^ "Atlanta Falcons Playoff History". Pro-Football-Reference.com. Retrieved December 10, 2017. ^ "Texans vs. Patriots - Team Statistics - January 14, 2017 - ESPN". ESPN. January 14, 2017. ^ Stites, Adam (January 14, 2017). "Texans vs. Patriots 2017 final score: New England overcomes turnovers with big plays that Houston couldn't match". SB Nation. ^ "Steelers vs. Patriots - Team Statistics - January 22, 2017 - ESPN". ESPN. January 22, 2017. ^ Stites, Adam (January 22, 2017). "Steelers vs. Patriots 2017 final score: New England blows out Pittsburgh on the way to yet another Super Bowl". SB Nation. ^ "Seahawks vs. Falcons - Team Statistics - January 14, 2017 - ESPN". ESPN. January 14, 2017. ^ Clements, Ron (January 14, 2017). "Seahawks miscues were non-factors in Falcons' blowout win". Sporting News. ^ Martin, Jill (January 22, 2017). "Georgia Dome's final NFL game has Super Bowl significance". CNN. ^ "Packers vs. Falcons - Team Statistics - January 22, 2017 - ESPN". ESPN. January 22, 2017. ^ "Falcons beat Packers 44-21 to reach Super Bowl". Reuters. January 22, 2017. ^ a b Hanzus, Dan (January 25, 2017). "Pats wearing white in Super Bowl, will definitely win". National Football League. Retrieved January 26, 2017. ^ Weaver, Tim (January 24, 2017). "Falcons choose to wear red jerseys for Super Bowl LI vs. Patriots". USA Today. Retrieved January 25, 2017. ^ "Top 10 stats on Patriots, Falcons heading into Super Bowl LI". ESPN. ^ "What happens when No. 1 offense meets No. 1 defense in Super Bowl?". MSN. ^ "Super Bowl LIVE Kicks Off at Discovery Green". Houston Press. Retrieved February 17, 2017. ^ Barron, David. "Super Bowl LI "Opening Night" at Minute Maid on Jan. 30". Houston Chronicle.com. Houston Chronicle. Retrieved February 13, 2017. ^ "James Baker, Ric Campo to lead Houston's Super Bowl bid". Houston Texans. Retrieved February 17, 2017. ^ a b Ekstein, Nikki (January 31, 2017). "The $400,000 Way to Do the Super Bowl". Bloomberg. Retrieved December 1, 2017. ^ Rachel (November 14, 2017). "Fan's Review of the Rolling Stone Super Bowl Party". fanhospitality.com. Retrieved December 1, 2017. ^ "Patriots to practice at UH, Falcons at Rice". Houston Chronicle. Retrieved January 24, 2017. ^ Rieken, Kristie (February 2, 2017). "Officials tell fans how to spot fake Super Bowl tickets". Associated Press. Retrieved December 1, 2017. ^ Carline, Pete (February 2, 2017). "Super Bowl diary: Lady Gaga Poker Faced on half-time show and Donald Trump, star-studded party cancelled and Tom Brady is a popular man". Daily Mail. Retrieved December 1, 2017. ^ Hinchliffe, Emma (February 3, 2017). "Uber barely hangs on in Houston ahead of Super Bowl, while Airbnb claims 'biggest nights ever'". Mashable. Retrieved February 5, 2017. ^ "The tradition continues: NFL to remain on broadcast TV". National Football League. December 14, 2011. Retrieved July 14, 2015. ^ Molloy, Tim (December 14, 2011). "NBC, Fox, CBS Extend NFL Deals Through 2022". TheWrap.com. Retrieved October 23, 2012. ^ a b "NFL Celebrates Hispanic Heritage Month". National Football League. September 15, 2016. Retrieved December 27, 2016. The season will culminate with Super Bowl LI live in Spanish on FOX Deportes and Entravision Radio. ^ "NFLEROS Premieres on FOX Deportes". Fox Sports. September 19, 2016. Retrieved December 30, 2016. ^ Tanklefsky, David (November 14, 2016). "Record World Series Numbers Help Fox Deportes Show Off Its Rebrand". PromaxBDA. Retrieved December 30, 2016. ^ "Super Bowl: Fox Sports Go Streaming Service Goes Down Briefly in 4th Quarter". The Hollywood Reporter. Retrieved February 6, 2017. ^ "Super Bowl 2017: How to watch the big game online". The Verge. Vox Media. Retrieved February 6, 2017. ^ "Live from Super Bowl LI: Intel's 'Be the Player' Set to Transform Analysis". Sports Video Group. Retrieved February 6, 2017. ^ Spangler, Todd (January 12, 2017). "Fox's Super Bowl LI Broadcast to Include Virtual Player POV Replays". Variety. Retrieved January 23, 2017. ^ Kerschbaumer, Ken. "Live From Super Bowl LI: Fox Sports Presence at Discovery Green Raises Bar". Sports Video Group. Retrieved November 30, 2017. ^ a b Vranica, Suzanne (January 25, 2017). "Snickers to Air First Live Super Bowl Ad". The Wall Street Journal. Retrieved February 4, 2017. ^ Fry, Erika (February 1, 2018). "Super Bowl Ads Can't Save TV". Fortune (print mail distribution): 12. ISSN 0015-8259. ^ Molina, Brett. "Nintendo devotes its first-ever Super Bowl ad to Switch". USA Today. Retrieved February 1, 2017. ^ "What Is Fiat Chrysler Up to for the Super Bowl?". Advertising Age. Retrieved February 6, 2017. ^ "Fiat Chrysler Avoids Politics in Super Bowl Ads, Plugs Alfa Romeo". Advertising Age. Retrieved February 6, 2017. ^ Godoy, Maria. "Budweiser's Super Bowl Ad And The Great Debate Over What It Means To Be An American". NPR. Retrieved February 4, 2017. ^ Framke, Caroline (February 5, 2017). "The story behind 84 Lumber's Super Bowl ad about Trump's border wall". Vox. Retrieved February 6, 2017. ^ Shields, Mike (February 6, 2017). "84 Lumber Super Bowl Campaign Shows Border Wall With a Big Door". Wall Street Journal. Retrieved February 6, 2017. ^ Payne, Marissa (February 5, 2017). "84 Lumber forced to re-tool Super Bowl ad rejected for depicting Trump's border wall". Chicago Tribune. Retrieved February 6, 2017. ^ O'Reilly, Lara (February 5, 2017). "The 84 Lumber Super Bowl ad's creative director explains the thinking behind the Mexican immigration-themed spot". Business Insider. Retrieved February 6, 2017. ^ "Geoffrey Rush as Albert Einstein: Nat Geo Channel Releases Super Bowl Spot for 'Genius' (Watch)". Variety. Retrieved February 6, 2017. ^ Petski, Denise (February 3, 2017). "'Genius' Teaser: Nat Geo Unveils Einstein Drama's Super Bowl Spot With Lady Gaga's 'Bad Romance'". Deadline.com. Retrieved February 6, 2017. ^ Lynch, Jason (February 5, 2017). "The First Overtime in Super Bowl History Gives Fox Another $20 Million in Ad Revenue". Adweek. Retrieved February 7, 2017. ^ "NFL 2016: How to watch in Australia". The Sydney Morning Herald. September 5, 2016. ^ "Das ist der Super Bowl LI! - puls4.com". PULS 4 (in German). PULS 4 TV GmbH & Co KG. Retrieved February 5, 2017. ^ "ESPN e Esporte Interativo exibem hoje Super Bowl com Lady Gaga; relembre outras apresentações" (in Portuguese). Leandro Lel Lima. Retrieved February 6, 2017. ^ "SUPER BOWL LI to be Broadcast in Triple-Simulcast for First Time Ever on CTV, CTV Two, and TSN, February 5". Bell Media. Retrieved January 26, 2017. ^ "Super-Bowl.dk" (in Danish). Retrieved February 16, 2017. ^ "NFL : Le Super Bowl LI" (in French). beIN SPORTS. Retrieved February 5, 2017. ^ "Super Bowl 2017 en direct et TV". Augsburger Allemagne (in German). Retrieved February 4, 2017. ^ "NFL – NFL: Super Bowl 2017 live – New England Patriots vs. Atlanta Falcons im kostenlosen Livestream". www.ran.de (in German). ProSieben/Sat.1 Sports GmbH. January 25, 2017. Retrieved February 4, 2017. ^ a b c "NFL 2016/17 Super Bowl". peotv.com. ^ a b Upal, Sunni. "Super Bowl 2017: When is the NFL final, what TV channel is it on, what time is kick-off and which teams are playing? Here's all you need to know". The Sun. Retrieved January 22, 2017. ^ "How to watch Super Bowl 51 online for free". TechRadar. ^ "Super Bowl 2017 live op FOX TV en FOX SPORTS" (in Dutch). Totaaltv.nl. Retrieved February 5, 2017. ^ Terrado, Reuben (January 24, 2017). "Super Bowl 51 between Patriots, Falcons to be aired live on free TV via ABS-CBN sports channel". Sports Interactive Network Philippines. Retrieved January 25, 2017. ^ "Channels that will broadcast the Super Bowl". Superbowl51.org. January 24, 2017. ^ "La Super Bowl LI, en directo y en exclusiva para todos los abonados de Movistar+ (Spanish)". Blog Movisfera (Comunidad Movistar). February 2, 2017. ^ "Super Bowl LI: New England Patriots v Atlanta Falcons". BBC. Retrieved February 3, 2017. ^ "Where to watch Super Bowl LI on British TV". NFLUK.com. NFL Enterprises, LLC. Retrieved February 1, 2017. ^ "Super Bowl LI is on Sky Sports 1, Sky Sports NFL and Sky Sports Mix on Sunday February 5". Sky Sports. Sky. Retrieved February 3, 2017. ^ a b "Bell appeals CRTC decision to air U.S. Super Bowl commercials". The Globe and Mail. Toronto. March 2, 2015. Retrieved March 12, 2015. ^ "CRTC opens door for U.S. Super Bowl ads to air on Canadian TV". The Globe and Mail. January 29, 2015. Retrieved January 29, 2015. ^ "Broadcasting Regulatory Policy CRTC 2015-25". Canadian Radio-television and Telecommunications Commission. Retrieved February 3, 2015. ^ "Bell wins right to appeal new Super Bowl ad policy". The Globe and Mail. Retrieved November 2, 2016. ^ "NFL Blitzes Trudeau in Arcane Super Bowl Advertising Dispute". Bloomberg. Retrieved January 18, 2017. ^ a b "Bell's Super Bowl ratings drop 39 per cent as CRTC ad policy takes effect". The Globe and Mail. Retrieved February 7, 2017. ^ Jackson, Emily. "Bell Media cites CRTC Super Bowl ad policy as a factor in latest round of layoffs". Financial Post. Retrieved February 1, 2017. ^ a b Faguy, Steve (January 27, 2017). "CTV Super Bowl LI plans". Fagstein.com. Retrieved January 29, 2017. ^ "It may pay to watch Super Bowl on Canadian TV. Literally". The Globe and Mail. Retrieved February 3, 2017. ^ "Bell will fight CRTC ad policy after Super Bowl ratings drop". The Globe and Mail. Retrieved February 8, 2017. ^ "Atlanta Falcons vs. New England Patriots Super Bowl LI". Westwood One. Retrieved January 25, 2017. ^ "TSN, Bell Media Radio, and NFL Announce Multi-Year Radio Broadcast Agreement" (Press release). Bell Media. September 18, 2015. Retrieved January 25, 2017. ^ "BBC RADIO 5 LIVE SPORTS EXTRA TO AIR WEEKLY COMMENTARIES ALL SEASON IN 2016". NFLUK.com. September 3, 2016. Retrieved January 25, 2017. ^ D'Andrea, Christian (February 5, 2017). "Super Bowl 2017: Pope Francis filmed message of peace and inclusion for the big game". SB Nation. Retrieved April 19, 2017. ^ Estrada, Cheryl. "HBCU Hall of Fame Players Honored at Super Bowl". Diversity, Inc. Retrieved February 6, 2017. ^ "Super Bowl LI Highlights and Analysis". The New York Times. February 5, 2017. ISSN 0362-4331. Retrieved December 15, 2017. ^ Hagemann, Andie (January 22, 2017). "Luke Bryan to sing national anthem at Super Bowl LI". National Football League. ^ Paulson, Michael (January 27, 2017). "'Hamilton' Is Coming to the Super Bowl". The New York Times. Retrieved January 27, 2017. ^ Wire, SI (February 5, 2017). "Who won the coin toss at Super Bowl LI?". SI.com. Retrieved February 7, 2017. ^ Coscarelli, Joe (September 29, 2016). "Lady Gaga to Headline Super Bowl Halftime Show". The New York Times. Retrieved October 1, 2016. ^ Halperin, Shirley (September 29, 2016). "It's Official: Lady Gaga to Headline 2017 Super Bowl Halftime Show". The Hollywood Reporter. Retrieved November 8, 2016. ^ "Lady Gaga kicks off Super Bowl halftime show performance with shocking, patriotic moment". AOL. Retrieved February 6, 2017. ^ "Falcons player says Lady Gaga halftime show contributed to Super Bowl meltdown". CBSSports.com. Retrieved February 28, 2017. ^ "Atlanta Falcons Mohamed Sanu blames the long halftime for Super Bowl 51 loss to New England Patriots". 247Sports. Retrieved February 28, 2017. ^ "Tom Brady Stats - Pro-Football-Reference.com". ^ "Can't-Miss Play: Tom Brady's first-ever playoff pick six goes to Robert Alford". National Football League. ^ "Super Bowl Records: Individual - Interceptions". National Football League. ^ "Can't-Miss Play: Julio Jones makes insane sideline catch in Super Bowl LI". NFL.com. Retrieved April 10, 2017. ^ Bowden, Mark (2008). The Best Game Ever: Giants vs. Colts, 1958, and the Birth of the Modern NFL. Atlantic Monthly Press. ISBN 978-0-87113-988-7. ^ "Super Bowl LI: New England Patriots recover from record deficit to beat Atlanta Falcons". BBC Sport. February 6, 2017. Retrieved February 7, 2017. ^ "Super Bowl 2017: Tom Brady leads Patriots to historic comeback win". Guardian. February 6, 2017. Retrieved February 7, 2017. ^ "Mike & Mike on Twitter". Twitter. Retrieved April 15, 2017. ^ "Playoffs with Score margin after 3 Qtrs >= 17". pro-football-reference.com. ^ "Patriots and Falcons set or tie 31 records in thrilling Super Bowl LI". CBS Sports. February 5, 2017. Retrieved February 6, 2017. ^ "Tom Brady: I think James White deserves game MVP". National Football League. February 5, 2017. Retrieved February 6, 2017. ^ "Watch New England Patriots vs. Atlanta Falcons [02/05/2017]". National Football League. ^ "5 Mind-Blowing Facts To Sum Up Patriots' Super Bowl Stunner". CBS Boston. February 6, 2017. Retrieved February 6, 2017. ^ Doctor, Stats (February 12, 2015). "Looking Back at Super Bowl XLIX Stats and Records". 101Sports.com. Archived from the original on April 2, 2015. Retrieved April 11, 2017. ^ Rapaport, Daniel (February 5, 2017). "The biggest comebacks in Super Bowl history". Sports Illustrated. Retrieved February 7, 2017. ^ "New England Patriots Biggest Comebacks". Pro Football Reference. Retrieved December 13, 2017. ^ "Patriots Vs. Falcons Game Summary". ESPN. ^ "Super Bowl LI - New England Patriots vs. Atlanta Falcons - February 5th, 2017". Pro Football Reference. ^ "The Amount Of Records Set And Tied In Super Bowl LI Is Astounding". New England Sports Network. February 6, 2017. Retrieved February 7, 2017. ^ "Tom Brady: 'Why does everyone want me to retire so bad?'". Patriots Wire. February 1, 2018. Retrieved February 1, 2018. ^ Sullivan, Tara (February 4, 2017). "Sullivan: For NFL great Belichick, performance is all that matters". North Jersey Media Group. Retrieved February 12, 2017. Wikimedia Commons has media related to Super Bowl LI.